I think it's finally safe to say that spring has OFFICIALLY sprung here in NYC. The flowers are blooming, the birds are chirping, and sundresses are making their 2018 debut at last! Instead of opting for a simple cotton LBD this season, dial up the drama with a lace or eyelet option. An eye-catching texture like this one gives feminine polish a captivating new edge, which basically means you can rock this piece anywhere from the office to cocktail hour and feel like a million bucks! I livened up my black frock with pastel accessories to give it an even springier vibe. Thick, twisted headbands like this one are super trendy right now, and paired with my round shades, I was feeling uber 60s. Two words: flower. Child. Until these last two weekends, I legit forgot what warm weather felt like. Anyone else with me? Now we're all faced with questions like, do I bring a coat? What type of jacket should I wear? And honestly, it's about darn time! Welcome spring, we've been waiting for you. Spotted on every street style star and fashionable coworker alike, the jumpsuit is now cooler than ever. 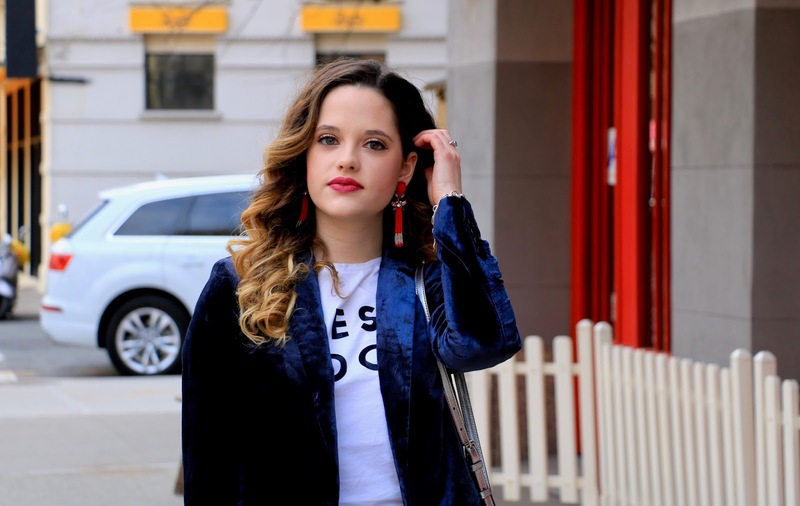 Wear yours over a logo tee (or plain crop top like me) and finish off your look with statement earrings. THAT'S the new way to wear this red-hot trend! Breeze between seasons with a chambray button-down. Whether it's tied around your waist or thrown over your shoulders, keep this versatile piece on hand to fend off the chills until summer. Elevate your daywear with popping accessories like fire-engine red earrings and a lip to match. 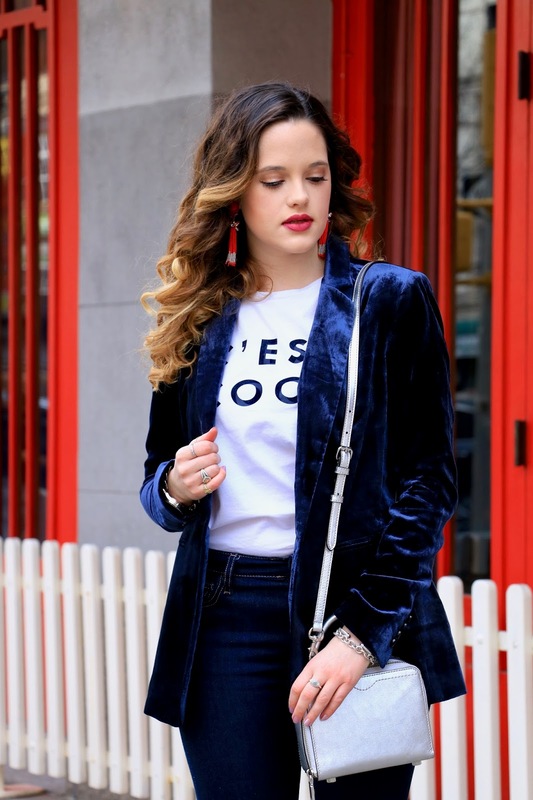 Red accents compliment virtually every color combo, but if red's not your thang, try cobalt blue or canary yellow accessories -- those hues are also known for being universally flattering. I recently wore this outfit to brunch with friends at The Smith and then shopping with Antonio. 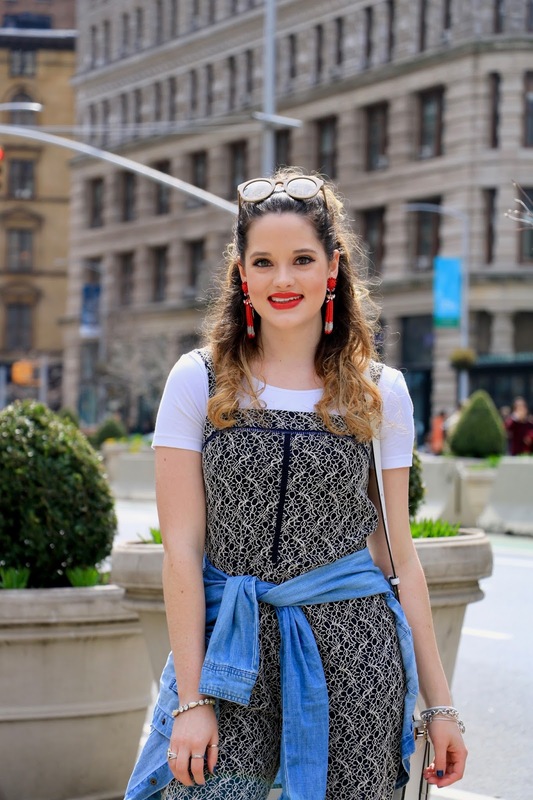 Walking all over the flatiron district that day, I realized how much I love jumpers, how I don't own enough of them, and how I desperately need more. Luckily they're SO huge right now so pretty much every store has tons of options to choose from. 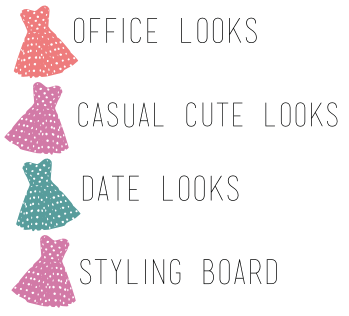 I love the styles below, and my goal is to add at least one or two more to my wardrobe before spring ends. While spring weather may be off track, your wardrobe doesn't have to be. Trendy separates are a fun way to get excited about warmer weather (whenever that's coming), and there's no pant hotter right now than the track pant. 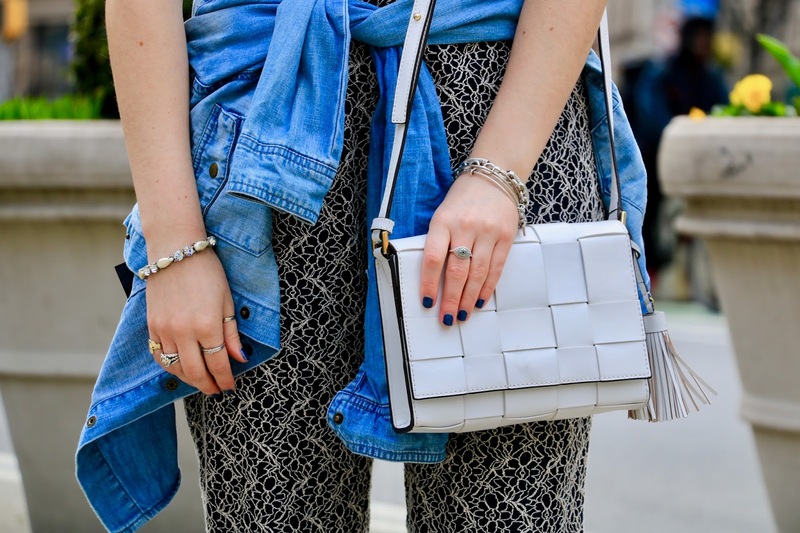 Fashion's favorite pant is a lot more versatile than you may think. I love mine paired with a luxe biker jacket for added polish. Heeled suede booties are ideal for now, while open-toed mules are perfect for later. If you're as sick of your winter coat as I am, ditch it and opt for a heavy leather jacket - it's almost just as warm but it's a whole lot chicer. For date night, rock a slinky velvet cami underneath. And don't forget so-now cat-eye shades for daytime. See? You'll look like you were MADE for springtime! We all thought our days of snow were behind us, but alas, it snowed once again earlier this week. Luckily it all melted by noon. Still though, snow? In April? If you're over it, raise your hand!